Former Olympian and coach V. Baskaran described today as "a sad day for Indian hockey", India's 0-2 loss to Great Britain in the final of the Olympics qualifiers in Chile. victim with chief coach Joaquim Carvalho deciding to step down along with the support staff. Under-fire Indian Hockey Fedaration chief K.P.S. Gill today brushed aside demands for his resignation in the wake of India's failure to qualify for the Olympics but admitted that it was a setback for the game. Former captain and Olympian Pargat Singh today held the Indian Hockey Federation top brass responsible for India's failure to qualify for the Olympics. Though India hockey touched a new low today having failed to qualify for the Beijing Olympics after suffering a 0-2 defeat at the hands of the Great Britain at Santiago today, this was not the first time the country faced qualification predicament. It proved to be a stroll in the park for Delhi Giants. Their bowlers were on target as were their batsmen. As many as 18 players including of Pakistani batsman Misbah-ul-Haq, Australian all rounder Shane Watson and Bangladesh captain Mohammad Ashraful, will go under the hammer in the second DLF Indian Premier League (IPL) auction which will be held here tomorrow. Serena shuts out Schnyder to win Bangalore title. This would be for the first time since 1928 that India had failed to qualify for the Olympics. Talking to UNI here today he said ''It's a sad day for Indian hockey''. ''The way the team played in the final came as a big surprise. The team did not play to their potential even for ten minutes." He said the major reason for the debacle was that the team had put pressure on itself by losing to Great Britain in the league phase. ''In the final, the team did not play aggressive hockey for even a minute after conceding two goals in the first ten minutes. The players were not committed'', he added. Baskaran, however, did not blame coach Joaquim Carvalho for the debacle and said the coach should be given a long stint. ''I will only blame the players'', he observed. “Fielding the same seniors for Asian Games and World Cup is a minus point. We cannot have non-performers in every tournament,” he added. Players like Ignace Tirkey, Dilip Tirkey and Prabodh are injury prone. The IHF has been repeatedly making the same mistake of persisting with these players while talking of seniority. He added that no player is indispensable. Looking ahead, Baskaran said, “It's history that we did not miss even a single Olympics since 1928. I am very sad that India did not qualify this time''. ''But we cannot sit on the history. We should overcome this tragedy and move ahead'', he added. Citing England as an example, he said, “England did not qualify for the soccer World Cup. But they had not stopped playing football''. ''The failure to qualify for Beijing Olympics is just one setback. If we do well in Commonwealth Games and World Cup, we can come back to the top,” Baskaran said. Indian Hockey Federation (IHF) Secretary K Jyothikumaran said that the IHF would give its reaction only after the team returns and president K.P.S. Gill interacts with the squad. Former Olympian V.J. Philips, who was also a member of the Indian team which had lifted the World Cup in 1975, attributed the defeat to "poor deep defence." "The last minute jinx of conceding a goal returned in the first match against Great Britain when after leading 2-0, we saw the rival levelling 2-2 in the second session and scoring the winning goal in the last minute", he said. Philips said this is due to the fact that the team has not been adopting any strategy to overcome this failing. "Is this a national team or a bunch of school boys, I wonder,” Philips observed expressing disappointment. "Only one player in the team, Raghunath was impressive in the tournament. But he too was not good in the final match against Britain", he added. ''It was a pathetic performance. We had five penalty corners but we could not convert them. This is one of our major shortcomings in the last 20 to 30 years''. ''In 1972, when we came back with a bronze after losing to Pakistan, we were berated. We were hit with eggs and other missiles because people expected nothing short of gold''. Indian hockey team's failure to qualify for the Beijing Olympics claimed its first victim with chief coach Joaquim Carvalho deciding to step down along with the support staff. Stung by India's 0-2 loss to Britain in the final of the Olympic qualifying event that dashed their hopes to secure a passage for Beijing, Carvalho decided to quit his job along with other support staff. Talking to PTI here soon after the debacle, Carvalho said his failure to deliver the results prompted him to resign. “I am as disappointed and hurt as any other Indian hockey fan. But having said that, failure to qualify for the Olympics is not the end of the road for Indian hockey. We now have to start from scratch and renew our attempt to become one of the top teams in the world," he said. Carvalho said he was still to speak to Indian Hockey Federation president K.P.S. Gill about his resignation but asserted that his decision was final. “In any case, for the moment, I am firm in my decision to step down along with assistant coaches Mohinder Pal Singh and Ramesh Parameswaran,” he said. The coach opined that there was still a lot of potential in the current team and that there was no need to press the panic button. "We must retain the core team and perhaps even induct a few junior players. Some of the seniors in the team might have to think hard about their future in international hockey," he said. New Delhi: Indian Hockey Federation vice-president Narender Batra, a bitter critic of chief K.P.S. Gill’s “autocratic” functioning, today stepped down from his post and called for the IHF's top brass to also resign in the wake of India's failure to qualify for the Olympics. Reacting sharply to India’s defeat against Great Britain, Batra said all top officials should take moral responsibility for the fiasco. "I do not have words. It's a shame. I am disappointed. I tried my best but failed. My idea was to start an initiative to revive hockey. All the federation officials should resign," he said. Training his gun at Gill, Batra alleged that coach Joaquim Carvalho's appointment was because of the IHF's policy to appease the Bombay Hockey Association. "I am not talking about Carvalho's ability. But the way he was appointed,"
He also alleged that coaches who were vocal were changed and Carvalho continued as he was an "yes man." Batra said it's unfortunate that a security person like Suresh Sharma worked as the chief of protocol. "It's sad that Carvalho has to report to Suresh Sharma, a security person who was made chief selector," he said. “It takes time to regain your position. We have put the process in place and the results will take some time,” he told PTI in reaction to demands for his stepping down. The IHF chief said he would have discussions with chief coach Joaquim Carvalho and the other support staff to find out the exact reasons for the debacle before making any statements. "It is not proper to respond at this stage. We will wait for the team to return first, then we will have a clear idea what went wrong", he said. India lost to Britain 2-0 in the final of the qualifiers in Chile to miss the bus for the Beijing Games for the first time in eight decades. Pargat said it was high time the IHF top bosses took responsibility and stepped down from their posts. "It's time the IHF office-bearers, including President K P S Gill and Secretary K Jyothikumaran, take moral responsibility of the poor performance of Indian hockey team in the Olympic qualifiers and immediately resign from their posts," Pargat told PTI. "It was not surprising that Indian hockey team failed to qualify for the Olympics. It was expected due to the performance of IHF," Pargat said, adding the government should take control of the federation to save the national game. Pargat said the resignation of IHF Vice-President Narender Batra, who used to oppose Gill's autocratic governance of the federation, would allow the top brass of the federation to function more whimsically. "His resignation will adversely affect the functioning of IHF as Gill and Jyothikumaran, who have virtually forged a nexus, will be free to ruin Indian hockey further," Pargat said. Pargat demanded the resignation of all the office-bearers of IHF. "Now the whole team of IHF should immediately resign and some authority, which is serious to uplift the game, should take control of the federation," he said. "We have to start afresh and an authority, which has the vision to develop hockey and bring sponsors for the game, is needed. Secretary of the Federation should be a person who knows the game," he said. Suggesting the steps which should be taken for the improvement of the sport, Pargat said the domestic circuit should be strengthened to prepare the players properly. It was in 1991, first time ever in Indian hockey history, that India’s qualification chances to the Olympics were hanging by the thread as eight-time Olympic champions had to go through the rigmarole of qualifiers for the Barcelona Olympics in 1992. That time, however, India qualified and played in Barcelona Games. Brig G.S. Sandhu, the then manager of the team, recalled that the team played well as a unit, dishing out some good hockey. 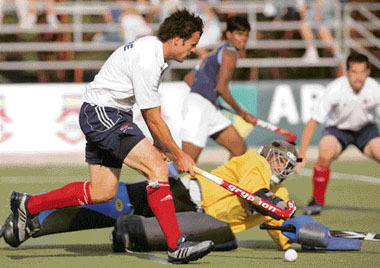 The qualifiers were played at Auckland with the team led by three-time Olympian Pargat Singh. Recalling the moments, Brig Sandhu observed that the under late Balkrishan as coach and G S Bhangu as assistant coach, team played a cracker of a match against Russia. Brig Sandhu, then vice-president of the Indian Hockey Federation, reminisced that apart from Russia, Malaysia and New Zealand were the other teams in the qualifiers. A charged-up Indians side won all the games and were through. Now chief executive officer at the PCA, Brig Sandhu said the second successive defeat against England in the final of the qualification tournament at Santiago was a ‘black day’ in the otherwise glorious history of Indian hockey. “Drastic steps are needed to restore the glory of Indian hockey,” he felt. A overall disciplined display enabled them to cruise past Mumbai Champs by six wickets in the low-scoring match of the ICL Edelweiss 20s Challenge match at Tau Devi Lal Stadium here tonight. In pursuit of the 116-run victory target, Marvan Atapattu-led Giants could not get off to a smooth start and lost two early wickets. Seam bowler Van der Wath struck in the very first over, getting the scalp of Munish Mishra, having him caught behind. Atapattu, who was reprieved by his Mumbai counterpart as Nathan Astle failed to latch on to a sharp cut at point. But former Sri Lanka opener failed to capitalise and was run out in the same over, second of Van der Wath, as Giants were two down for 11 in the third over. These were the only hiccups in the successful chase. Abbas Ali and Avishka Gunawardene combined together to undo the damage. Ali was positive from the world go. He showed his intent clobbering two fours and a six, taking 16 runs of the fifth over bowled by Tino Best. Once into his groove, he played some spanking strokes to keep the scoreboard moving. Ali played an unblemished inning. The fall of Gunawardene and A Bali in quick succession had no effect on the rampaging Ali. After these twin dismissals he found an able ally in Pric Bothas. Though not as confident as Ali, the South African wicketkeeper batsman showed tenacity as Ali kept going. Astle shuffled his bowlers to break the stand but in vain as Ali and Potha guided Gaints to victory with 10 balls to spare. Batting first, Mumbai batsmen did not have a decent outing. 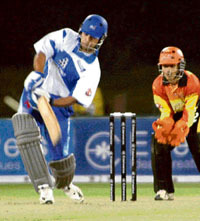 They struggled first against Shane Bond, playing his first game for the league. Other seamer I P Sudhindra was a bit expensive, but introduction of Dale Benkenstein and Ali Murtaza dried the flow of runs. Both were at their miserly best Ali being more successful taking two wickets. Astle waged a lone battle. He slammed two towering sixes in his 37-ball 32-run innings to give some respectability to the total. Dheeraj Yadav (27) and Kiran Powar (22) were next best scorers from the side. Fall of wickets: 1-41, 2-54, 3-83, 4-84. Bowling: S Bond 4-0-18-0, TP Sudhindra 3-0-30-0, J P Yadav 4-0-25-1, D Benkenstein 4-0-17-1, A Bali 1-0-5-0, A Murtaza 4-0-16-2. Fall of wickets: 1-2, 2-11, 3-52 , 4-55. Bowling: JJ van der Wath 4-0-17-1, TL Best 3.2-0-27-0, MS Kasprowicz 4-0-25-1, Avinash Yadav 4-0-27-1, NJ Astle 3-0-20-0. Among the 18 who will go under the hammer include seven New Zealanders, four Australians, three Pakistanis, two Bangladeshis, one Sri Lankan and South African each. However, no English cricketers figure in the list. The injury-prone Watson has not played for Australia, since the ICC World Twenty20 in September 2007 and has struggled during Queensland's Pura Cup campaign. He earned a recall to the national side for the CB Series but nagging leg problems forced him out again. Misbah, who was not included for the initial auction, is a big draw given his Twenty20 success in the last season. Mohammad Yousuf and Ashwell Prince, who were not picked up by any of the eight franchises last month, will be auctioned again. “There are 13 other foreign players who have shown keen interest to play in the first season,” a top BCCI official said. These include Shaun Tait, on a self-imposed indefinite break from cricket, Brad Hogg, who recently retired, West Indies' Dwayne Smith, and Yasir Hameed, the Pakistan batsman. Seven other Australians have also apparently expressed interest. This auction is expected to be relatively smaller than the first, which was worth $42 million. The eight franchise owners still have unspent money, a factor which has necessitated a second auction. All team owners have to finalise their squads 30 days before the start of the 2008 season. The IPL kicks off on April 18.